The USS Missouri (BB-63) was the third ship of the United States Navy to be named in honor of the state of Missouri. 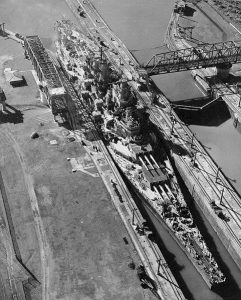 Also nick-named the “Mighty Mo” or “Big Mo,” she also has the distinction of being the last battleship constructed by the United States. More famously, the battleship was the location of the surrender of the Empire of Japan on September 2nd, 1945 (V-J Day) signifying the end of World War 2. The United States Navy initially placed the order for the Missouri in 1940 and saw her get commissioned in June of 1944. 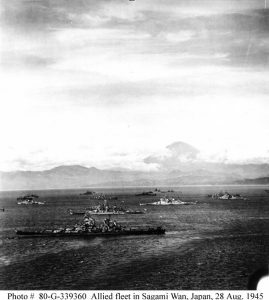 Warships of the U.S. Third Fleet and the British Pacific Fleet in Sagami Wan, 28 August 1945, preparing for the the formal Japanese surrender a few days later. Mount Fujiyama is in the background. 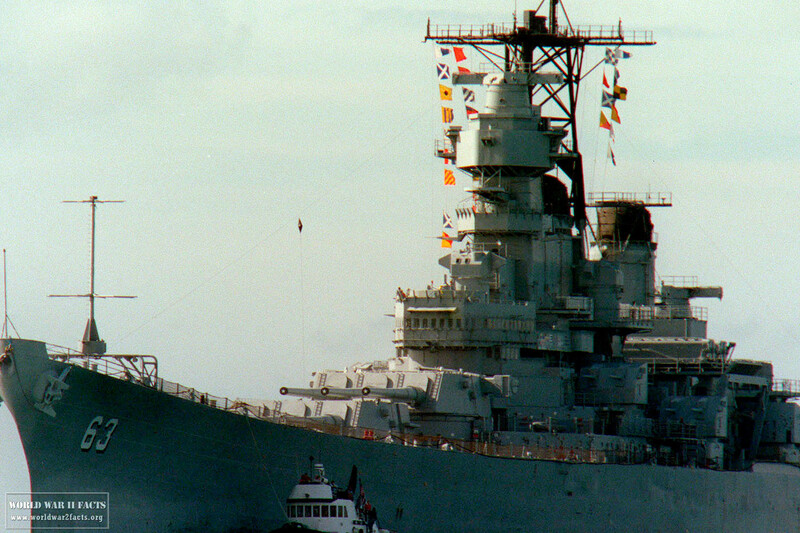 Nearest ship is USS Missouri (BB-63), flying Admiral William F. Halsey's four-star flag. British battleship Duke of York is just beyond her, with HMS King George V further in. USS Colorado (BB-45) is in the far center distance. Also present are U.S. and British cruisers and U.S. destroyers. During World War 2, the ship would see action in the Battles of Iwo Jima and Okinawa and also take part in shelling the Japanese home islands. The ship would see additional war time service during the Korean War and after being decommissioned in 1955 would be brought back to service in 1984. Mighty Mo would then provide NSFS (naval surface fire support) during Operation Desert Storm during January and February of 1991. During her total service in the United States Navy, the Missouri would earn a total of 11 battle stars and be decommissioned again on March 31st, 1992. She would remain on the Naval Vessel Register until being struck on January 1995. In 1998 the ship was donated to the USS Missouri Memorial Association and serves as a museum ship in Pearl Harbor, Hawaii to this day. Nickname: "Mighty Mo" or "Big Mo"
USS Missouri (BB-63) in the Miraflores Locks, Panama Canal, 13 October 1945, while en route from the Pacific to New York City to take part in Navy Day celebrations. Note the close fit of the ship in the locks. The beam of battleships of this era was determined by Panama Canal lock dimensions. 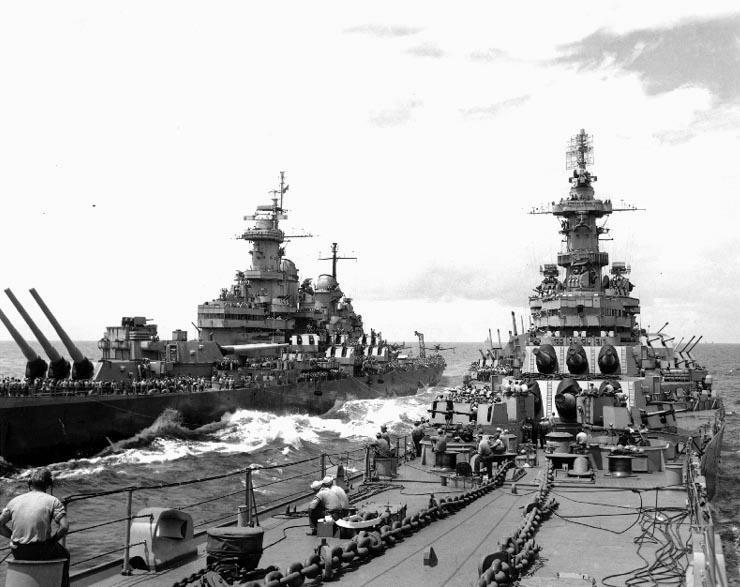 USS Missouri (BB-63) (at left) transferring personnel to USS Iowa (BB-61), while operating off Japan on 20 August 1945.
the final Iowa Class battleship (fourth in total) to be commissioned by the U.S. Navy (the Wisconsin, BB-64, was commissioned prior to the Missouri). Ms. Mary Margaret Truman, daughter of then Missouri Senator Harry S. Truman, would christen the ship at her launch. The primary gun battery of the Missouri consisted of nine 16 inch guns that were capable of firing 2,700 lb (1,200 kg) armor piercing shells in excess of 20 miles (32.2 kilometers). 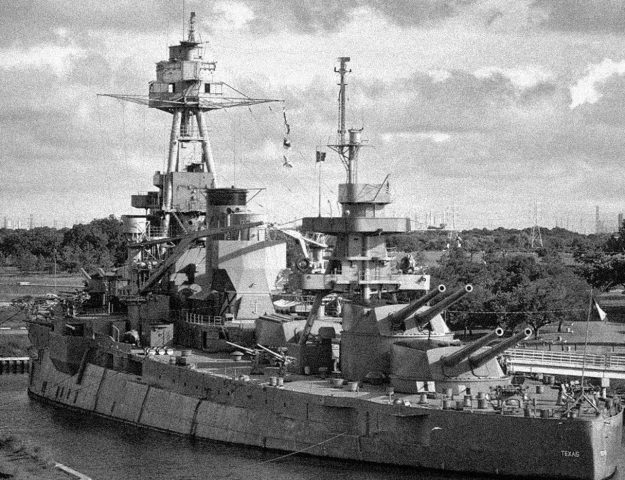 The secondary battery of the ship included 20 x five inch guns that were located in twin turrets. The five inch guns had ranges of approximately 10 miles (16 kilometers). 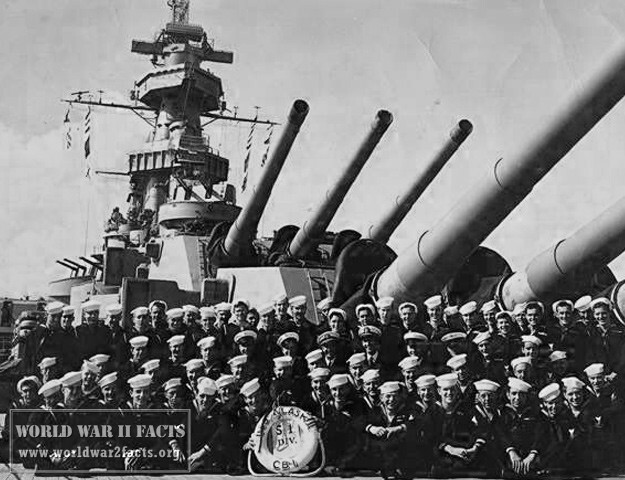 With the increased use of air power during WW2 and an increased need to protect the U.S. Navy’s fleet of aircraft carriers, the Missouri was outfitted with a number of Oerlikon 20 mm and Bofors 40 mm anti-aircraft guns to help defend against enemy airstrikes. When the Mighty Mo was brought back to service in the 1980s, these guns were removed and the ship had the Phalanx CIWS installed for point defense against enemy missiles as well as Tomahawk Armored Box Launchers for offensive strike via TLAM. Although BB-65 through BB-71 were ordered, the United States Navy would cancel their delivery due to the ending of WW2. Ulithi, West Caroline Islands on January 13th, 1945. At this point, the ship would service as the temporary HQ for Vice Admiral Marc A. Mitscher. On January 27th, 1945, the Missouri would sail as part of the Lexington carrier task group that was part of TF-58. On February 16th, 1945 the Task Force would launch the first air strikes against the Japanese mainland since the Jimmy Doolittle raid that took place in April of 1942. The USS Missouri (BB-63) watching over the sunken USS Arizona (BB-39) in Pearl Harbor. landings. Once TF-58 was ordered to return to Ulithi on March 5th, the Missouri would join the Yorktown Carrier Task Group and take part in strikes against Japanese coastal targets starting on March 18th, 1945. After conducting numerous strikes against Japanese airfields and naval bases near the Inland Sea and southwestern Honshū, the Missouri would re-locate to take part in the pre-invasion strikes on Okinawa. Along with the other fast battleships of TF-58, Missouri would take part in bombarding the southeastern coast on Okinawa on March 24th, 1945. When the USMC and US Army commenced the invasion of Okinawa on April 1st, the Missouri would rejoin the carrier screen. 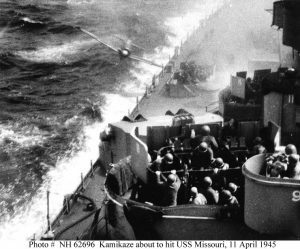 On April 11th, the Mighty Mo would be hit by a Japanese kamikaze on the starboard side just below the main deck. The crash would result in a gasoline fire at Gun Mount No. 3 which was quickly brought under control. The dent from the crash remains in the side of the ship to this day. 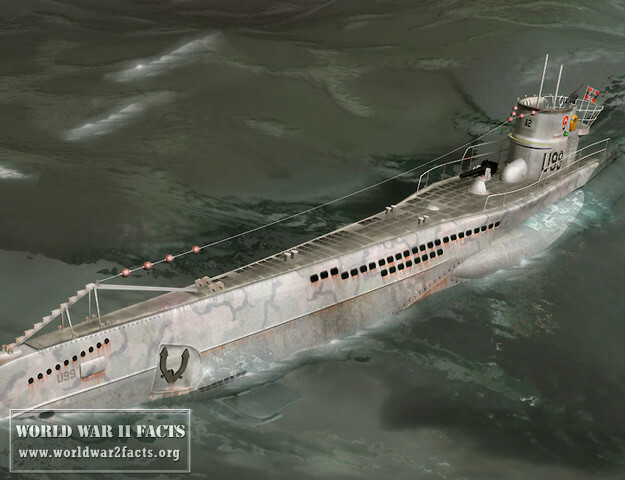 On April 17th, the Missouri would detect an enemy submarine approximately 12 nautical miles from the formation. 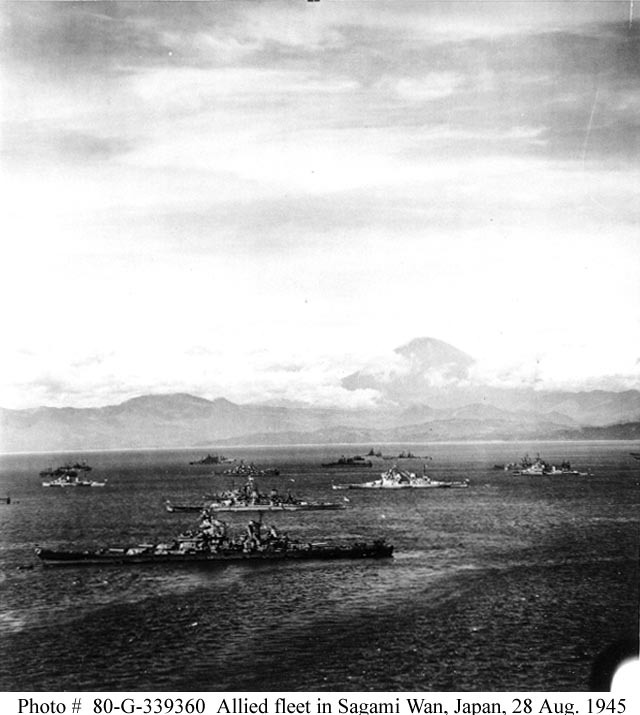 The force would send four destroyers and the Bataan to prosecute the contact that resulted in the sinking of I-56 (Japanese submarine). Missouri would detach from the Okinawa Task Force on May 5th after shooting down five enemy airplanes, aiding in shooting down six others, repelling 12 daylight attacks, and four night-time attacks by the Japanese during the battle. The ship is credited with destroying numerous gun emplacements and military / governmental buildings during the bombardment. The Missouri would pull in to Ulithi on May 9th, 1945 and then proceed on to Apra Harbor, Guam on May 18th, 1945. She would then embark the Commander of the U.S. Third Fleet, Admiral William F. Halsey, Jr. Missouri departed Guam on May 21st, 1945 and went back to the firing line off of Okinawa soon after. She would help lead the fleet in strikes against Japanese installations and airfields on Kyūshū on 2–3 June. After riding out severe weather for two days, the Missouri would continue striking Kyūshū on June 8th before departing for Leyte. The ship arrived at San Pedro Leyte on June 13th, 1945 after three continuous months of support for the Battle of Okinawa. The Missouri and other 3rd Fleet ships took part in attacks against the Japanese main island, Honshū, on July 10th. These attacks were a surprise to the Japanese at the time. The Missouri would then move to strike at the junction of both Honshū and Hokkaidō on July 13-14, 1945. The first time during the war that a ship would destroy a major installation in the Japanese islands was courtesy of the Mighty Mo on July 15th, 1945 when she severely damaged the Nihon Steel Co. and the Wanishi Ironworks at Muroran, Hokkaido. Over the course of the evening of July 17th and 18th, the Missouri would continue to strike industrial targets in Honshū. The U.S. carriers would continue to conduct aerial strikes against Japanese inland targets through July 25th. By the end of July, the United States Navy would gain sea control over the majority of Japanese inland waters. 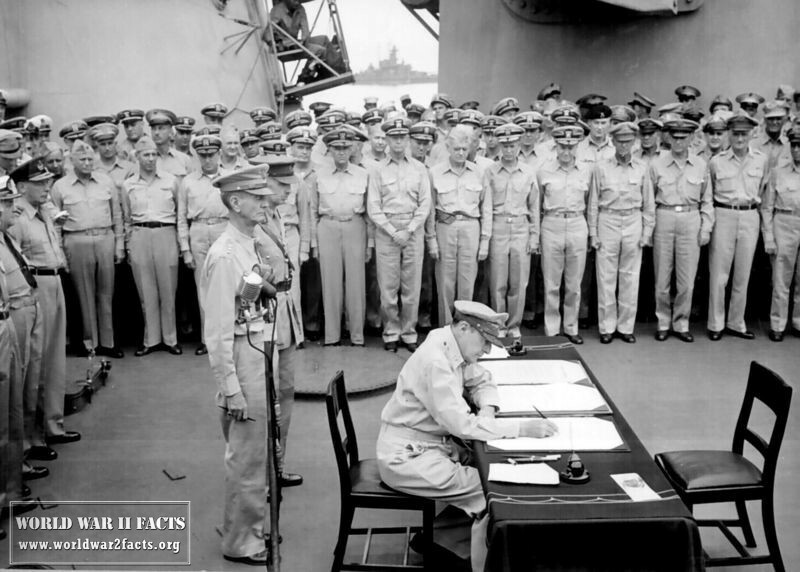 The USS Missouri was the location of the signing of the Japanese Instrument of Surrender on September 2nd, 1945. The ship would enter Tokyo Bay on August 29th, 1945 after transferring a landing party of 200 officers and sailors to the USS Iowa for duty ashore in Tokyo. Onboard the battleship was General of the Army Douglas MacArthur and numerous other Allied sailors and officers. The date of signing of the surrender is known as V-J Day and continues to be celebrated to this day. 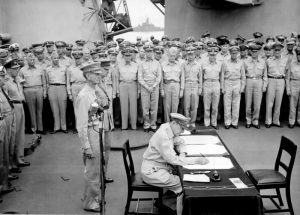 : General Douglas MacArthur signs as Supreme Allied Commander during formal surrender ceremonies on the USS MISSOURI in Tokyo Bay. Behind General MacArthur are Lieutenant General Jonathan Wainwright and Lieutenant General A. E. Percival. Other high ranking officials onboard the battleship Missouri for the signing of the Japanese surrender included: Chinese General Hsu Yung-Ch'ang, British Admiral-of-the-Fleet Sir Bruce Fraser, Soviet Lieutenant-General Kuzma Nikolaevich Derevyanko, Australian General Sir Thomas Blamey, Canadian Colonel Lawrence Moore Cosgrave, French Général d'Armée Philippe Leclerc de Hautecloque, Dutch Vice Admiral Conrad Emil Lambert Helfrich, and New Zealand Air Vice Marshal Leonard M. Isitt. "It is my earnest hope—indeed the hope of all mankind—that from this solemn occasion a better world shall emerge out of the blood and carnage of the past, a world founded upon faith and understanding, a world dedicated to the dignity of man and the fulfillment of his most cherished wish for freedom, tolerance, and justice." On-board the Missouri, the 31 star American flag taken ashore by Commodore Matthew Perry, U.S. Navy in 1853 in Tokyo Bay to open the port to foreign trade was displayed. The flag on display was really shown with the reverse side showing due to the fabric being so fragile that there was a protective linen backing sewn onto it to prevent further deterioration. About to be hit by a Japanese A6M "Zero" Kamikaze, while operating off Okinawa on 11 April 1945. The plane hit the ship's side below the main deck, causing minor damage and no casualties on board the battleship. A 40mm quad gun mount's crew is in action in the lower foreground. The photographer has been identified as Seaman Len Schmidt. Collection of Fleet Admiral Chester W. Nimitz. Battleship Missouri Memorial museum website, last accessed April 20th, 2013. HNSA Ship Page: USS Missouri, last accessed April 20th, 2013. Navsource Online Battleship Photo Archive, last accessed April 20th, 2013. USS Missouri History, last accessed April 20th, 2013. 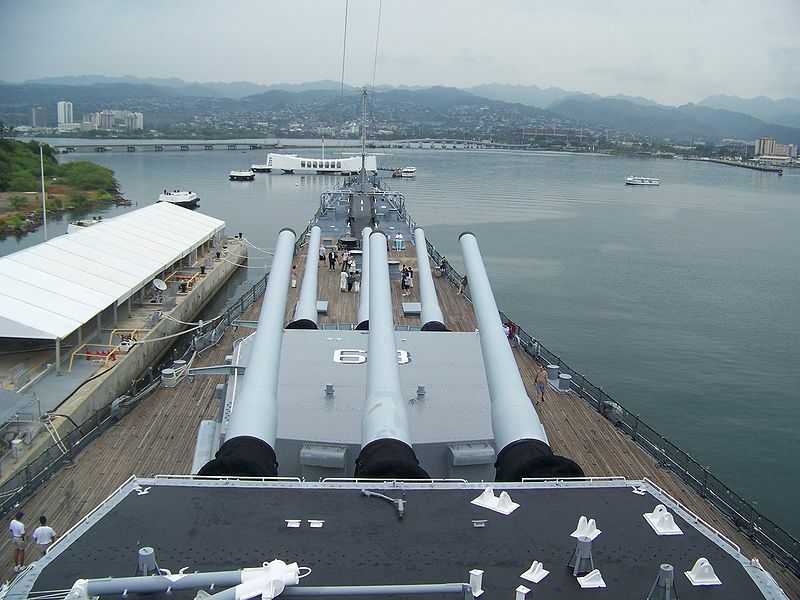 USS Missouri (BB-63) Association, last accessed April 20th, 2013. U.S. Naval Heritage Photo Gallery of the USS Missouri battleship, last accessed April 20th, 2013. U.S. Naval Vessel Register, USS Missouri (BB 63), last accessed April 20th, 2013.